Without risk there can be no innovation, but what happens when success is finally achieved? In order for innovation to be sustainable it must be driven by a structured management approach that strives for accountability, invention, and re-invention. Back in December, Innovation Enterprise held a Chief Innovation Officer Summit in New York City. One of the best discussions was by Naomi Fried of Boston Children’s Hospital. Ideation is not innovation, she said. It’s true. It is not enough to rely on each innovation team or group to effectively execute every idea that is put through the pipeline. Accountability is imperative. Members of a corporate team need to feel responsible for their work – to meet deadlines and to deliver what was agreed upon. Holding others accountable begins with clear communication of what is expected of them. To promote this point, put it in writing. By putting expectations to pen and paper, you ensure that everyone is on the same page and that your team is given the freedom to work towards their goals with confidence. In order to promote accountability it is also important to have a dedicated team that can fully vet and execute those ideas. Ultimately the decision must me made as to whether or not the idea moves forward, and your team must be given both ownership and accountability to make that call. Set clear action items, and expect follow through. Engage leadership in the process. As Ed Hoffman of NASA put it, “if the leadership is not engaged, there is no point”. Make sure that your leaders are present and accessible. Meet regularly to identify potential obstacles and opportunities before they become larger issues. 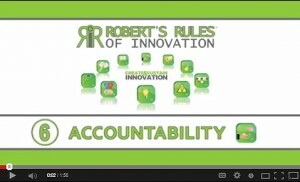 Learn more about Accountability and Innovation by watching this short video: http://youtu.be/5n23w6CkKEw. You can learn more about the above points, by reading Robert’s Rules of Innovation. Robert Brands is the founder of InnovationCoach.com and the author of “Robert’s Rules of Innovation”: A 10-Step Program for Corporate Survival, with Martin Kleinman, published by Wiley.